Most buyers don't intentionally try to bid for a home through an online auction. However, sooner or later you'll run across an online auction while home buying. You can be searching for homes online and find that perfect home with small print that says the sale is subject to an auction. Immediately, questions arise. What does that mean, to buy a home through an auction? Do you have to pay cash? How does auction bidding work? Could you lose your deposit? An online auction system is different from bidding for a home on the courthouse steps through a trustee's sale or a sheriff's sale. For starters, bidding is conducted via the web. It's all electronic. Further, contrary to popular opinion, not every home that is for sale through an online auction is a foreclosure. Some homes are short sales. Others might be for sale by the bank as a bank-owned home. You can find websites where investors are unloading homes that were once purchased from certain banks, generally as a packaged deal of bundled homes, known as buying in bulk, who now want to obtain highest and best offers for each house. Most of the homes are distressed sales but not every home that is up for auction fits that category. Investor-owned homes might be fixed up and ready to sell as a flipped home. Flipped homes tend to feature contemporary paint, upgraded flooring, stone counters, and new appliances, all of which make these remodeled homes very appealing to a first-time home buyer. Much like a barker at a country circus, the online bid price is meant to attract your attention. It is not necessarily the sales price you will pay and might have little relationship to actual market value. The estimated bidding price might be 50 percent to 75 percent of the amount the seller actually hopes to receive. It's a starting point for the auction. It is often lower than the seller will take. Many auction websites will post the estimated market value. To determine true value, you will need to examine comparable sales. These are the sales prices of similar homes that have recently sold. These are not the sales prices of homes for sale—because sellers can ask any price they want, it doesn't mean the home will sell at the asking price. Only the final sales price of a closed sale within the past few months is a comparable sale. The bidding often will begin at the bid price and move up. You can often watch the prices that are offered during the bidding period. Most sellers keep secret a reserve price. If the reserve price is not offered, the seller is not required to sell. For example, a seller might submit a home listing that is worth $400,000 to the auction website at an enticing price such as $200,000 for an opening bid. Buyer A might bid $200,000. Buyer B might bid $225,000. Buyer A might then raise her first bid to $235,000. If the seller's undisclosed reserve price is $375,000, this home will not sell to any of those bidders, and the auction will not be finalized—which to some people seems to sort of defeat the purpose of an auction. A potential auction bidder shared his reluctance to bid for a home through an online auction company because he read somewhere online that a buyer lost his earnest money deposit, so the buyer was nervous. That doesn't really happen. First, buyers tend to lose deposits not because the company was crooked but because the buyer misunderstands the rules or fails to perform. Realize that once your offer is accepted, your earnest money deposit might be at risk if you later decide to cancel. Most auction websites, including Fannie Mae's HomePath, sell their homes in As-Is condition, meaning you generally cannot renegotiate on price because you discovered a defect or found something terribly wrong with the house. Your first step is to establish an account at the website, which could include providing your credit card number for the earnest money deposit. Determine whether you can obtain financing, as most auction sites allow financing, and speak with a lender prior to placing a bid to make sure you can qualify for a loan. On some auction websites, you can watch the bidding take place. An initial bid will begin the process. There might be minimum requirements regarding the amount of a subsequent bid, known as incremental bids. If the incremental is set, for example, at $10,000, it means if the first bid is $100,000, the second and subsequent bids must be increased by at least $10,000, so a second offer of $100,001 will not be accepted. Under this scenario, the second bid must be at least $110,000 with a third bid set at $120,000, and so forth. If the auction home is a short sale, bear in mind that the seller might have already accepted an offer and now awaits bank approval. The bank, in turn, might instead elect to place the home for auction to try to obtain a higher offer through an online auction website. 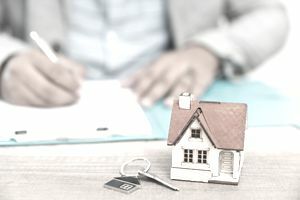 This type of auction is permissible by the bank because the bank is entitled to the highest price possible and, in a short sale, the bank sets the rules, even though the bank does not own the home. Some websites such as Auction.com require that buyers pay a 5 percent premium on top of the sales price, which is how short sales can sell at a price that exceeds market value. For this reason, the buyer who signed the original sales contract can sometimes win the home without bidding. You might ask your agent to find out if there is an existing buyer through MLS who is already under contract. Tip: If you are working with a real estate agent, you might ask your agent to help you to buy a home through an online auction company, especially since the agent is typically paid by the seller.